The Player Comparison Tool can help you win a title! Published: Aug. 12, 2013 at 05:07 p.m. Updated: Aug. 19, 2013 at 05:49 p.m. Need help setting your fantasy lineup or making those tough roster decisions? You can get instant feedback based on your personal league customizations using the SAP Player Comparison Tool! Cheat sheets. Draft strategies. Sleepers. Busts. Rookies. The list of tools fantasy football owners have at their disposal these days is just endless. Well, NFL.com is about to add another - welcome to the new SAP Player Comparison tool! This innovative feature is available to anyone who signs up for an NFL.com fantasy football league (and really, why would you play anywhere else?). The analysis is based on five important categories - Performance, Matchup, Consistency, Upside and Intangibles. The SAP Player Comparison Tool - which is 100 percent FREE to NFL.com users - is also customizable to your specific league. You can also rate which categories are more or less important based on your own opinion. The tool also knows which players are on which fantasy teams within your league, which makes generating the advice you need even faster. In one click, it can easily analyze which free agent on the waiver wire is the best to add. It can also analyze if a pending trade is fair. To prove how informative and effective the SAP Player Comparison Tool is for fantasy owners, we put it to the ultimate test - a head-to-matchup with the NFL Fantasy LIVE player rankings. 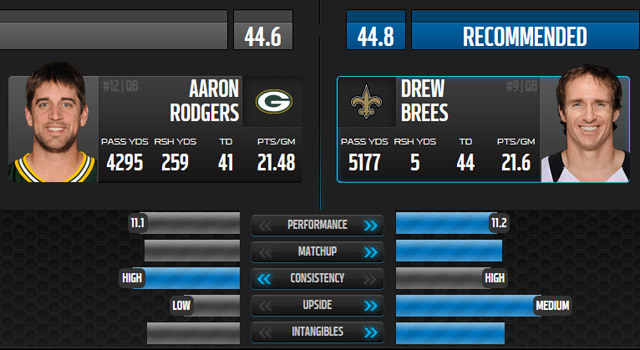 SAP Comparison Tool: These two players are as close as close can be at the quarterback position, but SAP is going with Brees over Rodgers. The Saints quarterback rates higher in overall performance, upside and intangibles. Brees, a durable superstar who has finished among the top two quarterbacks in four of the last five seasons, has become a virtual lock to throw for 5,000-plus yards and right in the neighborhood of 40 total touchdowns. NFL Fantasy LIVE: The consensus top quarterback on NFL.com is Rodgers, and he's also the first player being drafted at his position based on average draft position. However, I moved him down to No. 2 - below Brees - based on two factors. First, OL Brian Bulaga is out for the season. That hurts what was already a questionable offensive line. Second, Jordy Nelson's status for Week 1 is now in doubt after he required an operation on his knee. SAP Comparison Tool: Peterson has moved ahead of Foster on most draft boards, and SAP backs that train of thought. He ranks ahead of the Texans runner in performance, consistency and intangibles while still holding a high level of upside. The top-scoring running back in fantasy football last season, Peterson isn't likely to rush for 2,000-plus yards again - but is remains the safer pick among running backs from a fantasy perspective. 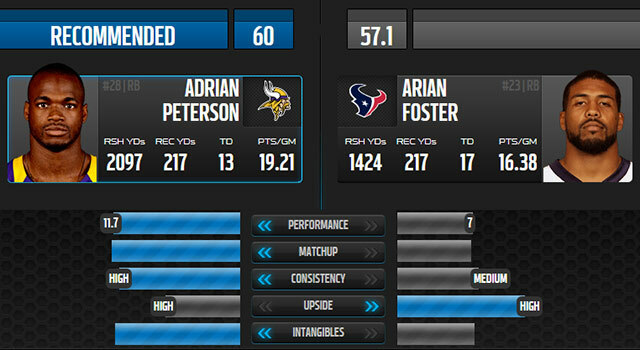 NFL Fantasy LIVE: Our crew concurs with the SAP Comparison Tool - Peterson should be the top pick among running backs. Three of our five analysts went with Peterson, including myself. While I was and continue to be high on Foster, the fact that he's been inactive during training camp due to calf and back issues is at least a small cause for concern. As a result, it's hard to argue against taking A.D. with the first overall selection. SAP Comparison Tool: The decision to draft either Green or Bryant will be a difficult one, as both are coming off breakout seasons and should continue to roll in the stat sheets. Really, it's mostly a win-win scenario - these players finished within five fantasy points of each other in standard leagues. SAP considers Bryant the better choice, though, as he's rated higher in performance, consistency and intangibles than Green for 2013. 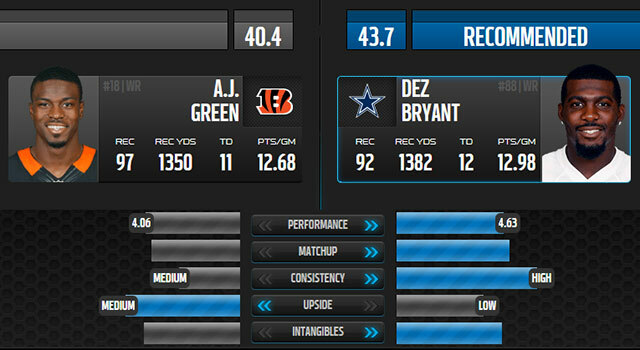 NFL Fantasy LIVE: Once again, the NFL Fantasy LIVE consensus calls Bryant a better option than Green. In fact, four of our five analysts prefer the Cowboys wideout. I would go with Bryant based on the fact that there is less competition for targets in Dallas, and I like Tony Romo much more than Andy Dalton at the quarterback spot. I wouldn't be shocked to see Bryant overtake Calvin Johnson in fantasy points at wideout this year.